Bardahl Multi Parts Cleaner (Brake Cleaner) safely removes grease, oil and other contaminants. It provides full and fast cleaning and degreasing of all electric, brake and clutch parts. It is a reliable solvent to remove oil, grease, dirt, brake fluid, and residuals, as well as glue and sealing residuals of car parts. It can be applied without disassembling. This product is also suitable for the removal of spare parts preservatives. This cleaner has a great penetrating and cleaning power because of constituents specially geared for one another. 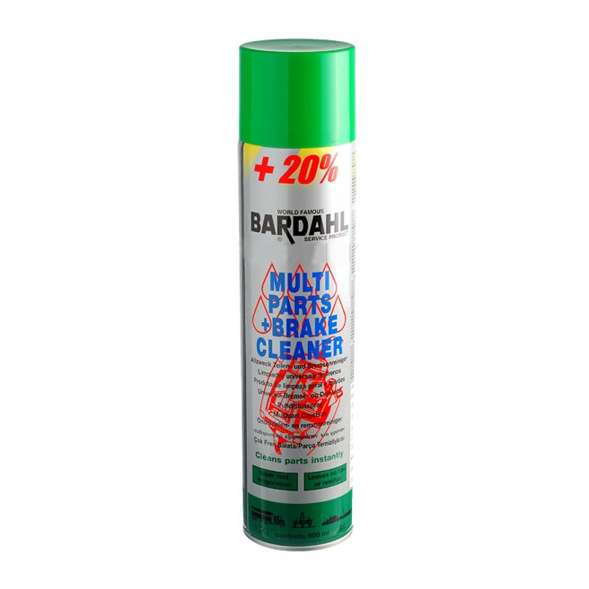 Applications Bardahl Multi Parts Cleaner will safely clean brake drums, liners, cylinders, springs, but also clutch parts and all kind of electric parts. For cleaning disc-, drum-, and power brake systems. It can be applied without disassembling the unit. This product is quick drying, will not cause rust and leaves no residuals.